Industrial automation refers to application of various control systems to operate equipment in factoris or other manufacturing units. Today, industrial automation is used for operating several factories, machinery, heat treating boilers and ovens, steering and ship stabilization, switching on telecom networks, aircrafts and related applications, and automotive assemblies. Over several years and with incredible investment in research and development, the global industrial automation market has evolved to reduce the burden of labor on humans. 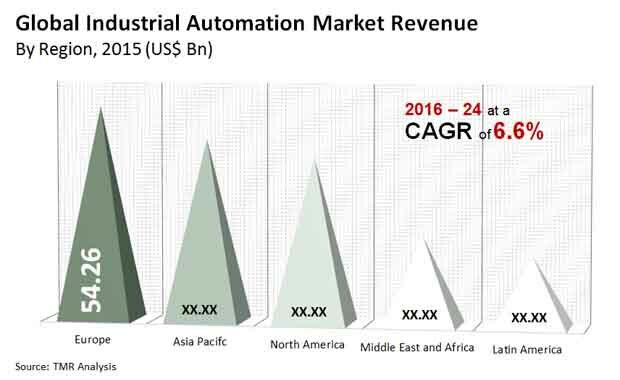 According to the research report, the global industrial automation market is anticipated to reach a valuation of US$352.02 bn by the end of 2024 from US$182.64 bn in 2015. Between the forecast years of 2016 and 2024, the global market is expected to expand at a CAGR of 6.6%. Several advantages of industrial automation have been its driving force in the global market. The market is also being fueled by the growing demand for industrial systems and technologies that lighten the load on of human interference and ensure operational efficiency. The biggest advantage of industrial automation technologies is that they reduce time and over persistent usage cut down manufacturing costs as well. Several industries are installing industrial automation as it promises reduction of human error. Additionally, the market is also expected to have soaring revenues in the coming years due to the flexibility these technologies offer. For instance, factory managers can change manufacturing schedule rapidly in response to the seasonal fluctuations. The strong growth in the CNC technology segment is driving the global growth of the industrial automation market, especially in the Asia Pacific and Europe region. Industrial automated products are manufactured in large varieties, each differing from another based on automation type, instrumentation, flow computers, analyzers, operation, and geography. The industrial automation market has been globally emerging to be a relatively more attractive space for investment by organizations across the world. The usage of robots in industrial controller mechanisms is an established trend. Thus it paves the way for larger adoption of the industrial control and industrial automation equipment. In spite of this, the development of the global industrial automation market is affected with massive threats in some regions all over the world, considering the fact that the method caters to human labor replacement with machines and computers. On the basis of various automation types, the global industrial automation market is segmented into distributed control system (DCS), programmable logic control system (PLC), machine vision system, manufacturing execution system (MES), human machine interface (HMI), supervisory control and data acquisition (SCADA), product lifecycle management (PLM), plant asset management, computer numerical control (CNC) routers, electronic control units (ECU),and other types. Among the automation type segments, the PLM segment constituted the biggest market share, followed by MES, in 2014. On the basis of end use industries, the global industrial automation market is segmented into automation and transportation, metals and mining, oil and gas, pulp and paper, hydro power, energy and power system, chemical, material and food, measurement and instrumentation. There is rapid growth in demand in the environment and building technologies, heavy industries, and other segments. The global market for energy and power systems is one of the major factors that are driving the demand for industrial automation industry, globally.